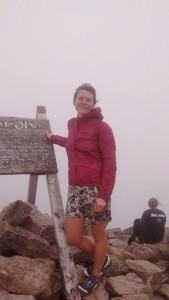 Heather ‘Anish’ Anderson is the only person – man or woman – to simultaneously hold a self-supported fastest known time on both the Appalachian Trail and the Pacific Crest Trail. Her words, however, make her seem more poet than athlete. But this is only one of the many contradictions of Anish. Hiking 50 miles a day in her trademark dress, she pairs accomplishment with humility, sheer willpower with empathy, grit with grace – she is beauty and the beast, all rolled into one. Anish after hiking the AT in 54 days. Anish has a long history with the mountains. 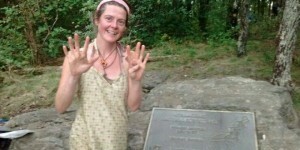 She began her relationship with them in 2003, when she went on her first backpacking trip – the 2,172-mile Appalachian Trail. Despite being admittedly unprepared, she finished the trail in 4 months. 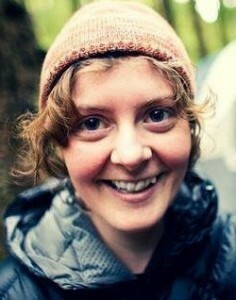 By 2007, she had hiked all three of the nation’s longest trails – the AT, the 2,663-mile Pacific Crest Trail, and the 3,100-mile Continental Divide Trail – to become a triple crowner. 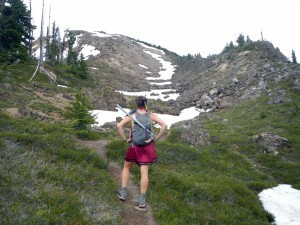 She went on to set the fastest self-supported time on the PCT in 2013. And a few weeks ago she stood on top of Springer Mountain, with two major records and 17,000 miles between her present day self and the shy 21-year-old who took the first steps of a life-long journey. 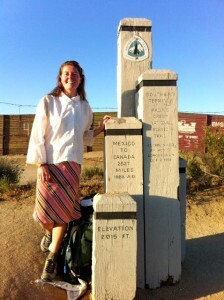 Anish at the Southern terminus of the PCT, ready to begin her first record-breaking hike. Thirty-six hours after shattering the Appalachian Trail’s self-supported speed record, Anish was shouldering a huge backpack for a four-day hike above tree line. In Washington State, the weather waits for no one. She’s been working her way through the Bulger List, a list of the hundred highest mountains in Washington State. She completed more than half of them while training for the AT. Halva – A confectionary mix of sugar, tahini, sesame seeds, and other ingredients, can be found at most natural markets. Trail Butter – Nut butter with coconut oil, honey, and other natural ingredients. Salazon Chocolate – Dark chocolate with sea salt. It was a tough start on Katahdin for Anish, who suffered a streak of bad weather through Maine. The Appalachian Trail is notoriously hardest near its northern terminus, which is what most thru-hikers reach last. 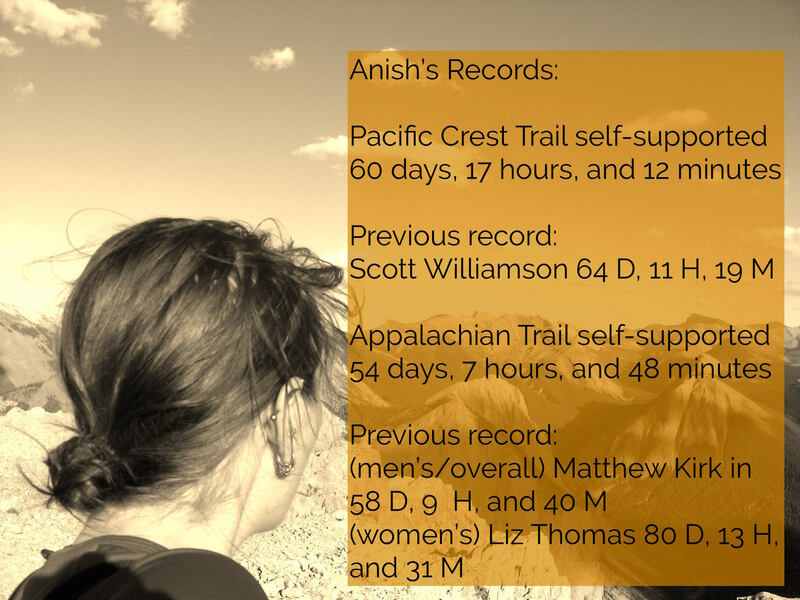 But Anish didn’t have the luxury of working up to that section, since most FKT (fastest known time) record attempters hike the Appalachian Trail southbound. There is sort of a parabola effect when a hiker is covering 50 miles a day; They strengthen themselves at first but eventually, due to weight loss, sleep deprivation, and a total lack of recuperation time, the brutal pace of a record-breaking hike actually weakens the person attempting it. So getting the hardest part out of the way first is usually the safest thing to do, if a little demoralizing. 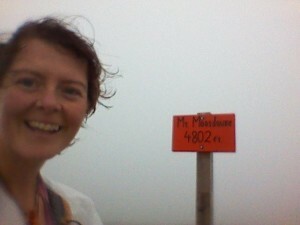 The summit sign and Anish’s face were the only beacons in the fog when she crossed Moosilauke. But Anish, whose last hike before heading east was Mt. Rainier, where she spent sleepless days traversing glacial crevasses, had stepped up her preparation. “In the past I ate a lot of junk and typical hiker food so this time I really went out of my way to seek out healthy food.” She overhauled her eating system and changed her workout. “I do a lot of cross training to make sure my body’s balanced muscular-wise.” She planned her post office drops meticulously, often running into towns with minutes to spare. “That was probably my biggest challenge on my whole hike, meeting the business hours at all of the places I had boxes,” says the woman whose feet were bleeding by the end of her trip. Most remarkable, though, was Anish’s reaction to her lowest moment, when her physical and mental preparation failed her. “I threw away my schedule. I stopped worrying about the record or keeping track of how many miles I was doing,” Anish explains, “every morning just getting up and hiking with the intention to give it 100 percent and know that when I crawled into the tent at the end of the night that I had given a hundred percent.” The desire to beat the record was still there, but the reason had changed. After overcoming the hardest parts of the trail, she realized she was hiking only for herself. “There was a point where I realized all these challenges and self esteem issues that have plagued me my entire life, in the morning, hiking in the dark, and I suddenly realized that that was the whole purpose and meaning of this hike.” Anish hiked often during dark, but she is far from regretting her headlamp’s view. Her night walking let her see a different side of the trail – the scampering, slithering side. “I saw tons of wildlife that I never saw the first time I hiked the AT… There was a night in the Smokies where I saw like 20 bears. I saw a copperhead snake, which I had never seen in my life.” Not every hiker desires these encounters, but for Anish, these moments were some of the major highlights of her trip. 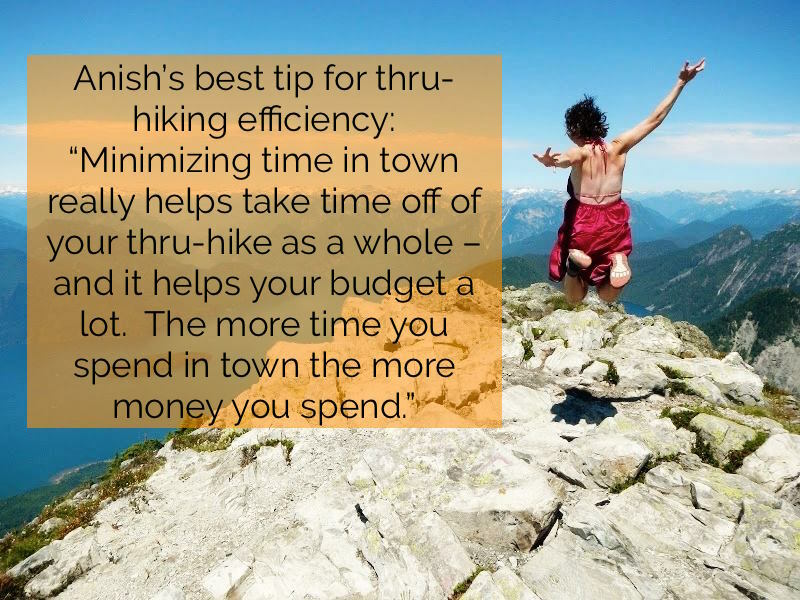 There have been some suggestions that record attempters experience less than regular thru-hikers because of their accelerated pace. But Anish didn’t spend less time on the trail than most people; she simply packed it into a smaller box. 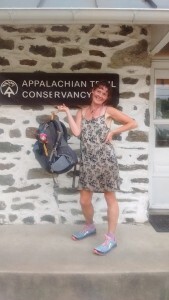 She walked to Springer at the same three-mile-per-hour pace most thru-hikers move at – but she sacrificed sleep, town time, and personal time for her ultimate goal. The thru-hiker community is a small one, but the fastest known time community is microscopic comparatively. Previous record holder Matthew Kirk immediately sent a graceful email to Anish the night that she finished. And as that community has grown and come into the national spotlight, it has moved slowly away from having separate gender categories. Jenn Pharr Davis, who owned the supported AT record for four years before Jurek’s recent achievement, has said that she no longer believes in separate categories for men and women on long-distance trails, given the fairly even split between male and female record holders. 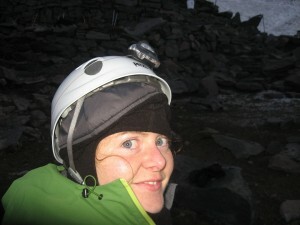 Before beginning her record attempt, Anish stated that she wanted to bring parity to the men’s and women’s records for the fastest known unsupported hike by beating both. As a community, Anish believes, we are past that point. Anish at the ATC headquarters – the official half-way point. Preparing for a hike at elevation with her ice axe and dress. Anish is a master of accomplishing the impossible, which makes her an inspiration to many and incomprehensible to most. When someone accomplishes something hard, we congratulate them; but when someone accomplishes the impossible, we can be guilty of dismissing them as super-human, as if their success is second nature. But Anish wasn’t born to hike. She had to go out and find it. The other hikers on the trail joined that chorus, dismissing her as another newbie who would be chewed up and spit out by Appalachia. But bullying belies fear, and four months later Anish stood on top of Katahdin with the knowledge that every one of her detractors had quit the trail. She is living testament to the platitude a self-doubter wears as armor: will power is the truest predictor of success. 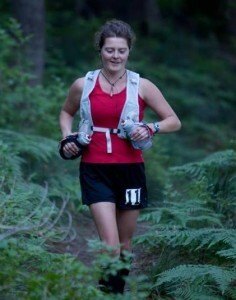 Anish running her first 100 mile race. Hiking South this year, she often felt like she was passing her former self walking North. “It was like hiking back in time,” says Anish, “I was in lots of pain and I’d have these moments where I would escape, imagining if I had passed myself on the trail right then.” But her self-reflection was a two-way street. Despite being a self-described introvert, Anish lives for encouraging others. This is part of what makes her ideal for her future career plans: coaching. She got her personal trainer certification last year so she can help others meet their physical goals – obviously with a focus on endurance. “That’s sort of a parallel to what I do but it’s not like crafting what I do into a job. I do not want to make hiking a full job because I don’t want to lose the passion for it, I don’t want it to ever feel forced.” Her well of optimism combined with her ability to focus on what people get out of their experience as opposed to what numbers they accomplish make Anish an ideal coach. And the woman who crushed the two longest distance unsupported records in the country isn’t going to sugarcoat her advice. “Life is never going to hand you six months to go backpacking, it’s never going to hand you the career of your dreams, it’s never going to hand you the perfect relationship. All of these things take work, they all take years of you being willing to make sacrifices and to step forward and make these things happen for yourself,” said the hiker who has willed her own reality into being, one mountain at a time. Learn more about Anish here. She did the thru-hike speed run the correct way, unlike Scott Jurek who almost ( and still might ) cost all future hikers the grand finale in Baxter State Park. You are amazing Anish. Very inspiring.